"Hydria" with Black-figure decoration by the "A.D. Painter" portrays "women at a fountain house." c.520 bce, 20 7/8" height. 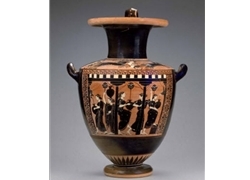 Moving into the Greek classical era, the painted vases become extremely refined. The images usually relate a story about the gods and goddesses, the heros and heroines, or show people engaged in religious and daily activity.